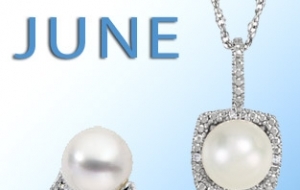 Pearls, Alexandrites, and Moonstones, OH MY! June has three stunning birthstones, so those born in June have a lot of choices! Pearls are classic, they very in sizes, shapes and colors. But did you know that pearls are the only gemstone that comes from a living creature that doesn’t have to be polished or faceted in order to show its natural beauty? Alexandrites are magical. In daylight and fluorescents the stone gives off a brilliant green color. In incandescent light the stone can look purple and red. Moonstones show a floating play of light, similar to a cat’s eye or multirayed star. They can come in a multitude of colors such as green, blue, peach, and champagne.